Marrugeku performed an excerpt from their show Cut the Sky (click here for more information) for French President Emmanuel Macron and Prime Minister Malcolm Turnbull during the French leader’s visit to Sydney on the 3rd May 2018. 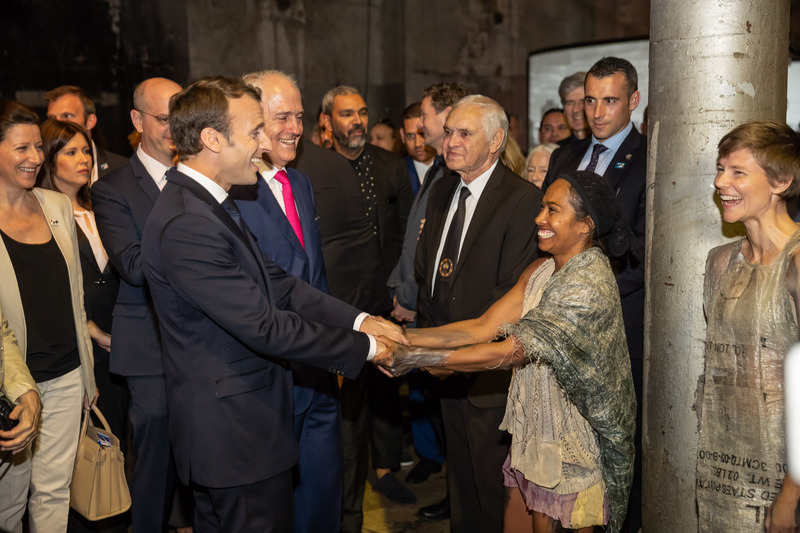 Citing the President’s specific interest in meeting indigenous artists dealing with ideas around climate change, Marrugeku was invited by the French Embassy to both perform and meet with Macron at Sydney’s Carriageworks. Both leaders had warm and complimentary words with the cast after the performance, with Macron later tweeting, in response to an explanation of the word ‘Liyan’, a term used by the Yawuru people and also other language groups of the Kimberley — “A deep sense of humanity and belonging to the world is what the word “liyan” means to Indigenous Australians. I could feel this energy coming from the heart thanks to Marrugeku dance company, who denounces climate change through their art” (click here for Macron’s Twitter post). Marrugeku’s Co-Directors Rachael and Dalisa were also able to speak to the President about their upcoming show Le Dernier Appel / The Last Cry (click here for more information), timely, given the subject matter of the show and the President departing for New Caledonia that afternoon. It was certainly a wonderful opportunity to perform for a leader who is, like Marrugeku, bringing climate change to global attention.